DARIEN — Darien resident Pat Gentile has long been involved with the local Boy Scouts. For 20 years, he’s worn many different hats in the organization: he’s served as a scoutmaster, a board member of the Andrew Shaw Memorial Trust and as dad to two Eagle Scouts — the highest honor a Boy Scout can earn. Gentile, wanting to spread the values of scouting to all members of the community, turned to Venturing, an inclusive program through the Boy Scouts of America for both boys and girls, ages 14 to 21. This past fall, Gentile formed a coed venture crew of 20 students with the goal of creating a new curriculum for a summer camp for underprivileged children in South Norwalk that Gentile started a few years ago. In 2015 when Gentile was working at the South Norwalk Community Center, the Darien resident discovered many of the elementary children did not have the option of a local summer camp to attend. “They had a whole bunch of kids there, but didn’t have a summer program,” he said. With the help of adult volunteers, Gentile decided to create one and drew on his knowledge of old Boy Scout programs to craft a STEM — Science, Technology, Engineering and Math — curriculum. So was born the STEM summer camp, run in partnership by the Connecticut Yankee Council of the Boy Scouts of America and the SoNo Community Center. “We were serving the program to kids all over the community,” Gentile said. What began with 56 campers in 2015 quickly expanded to over 200 in 2016 — not unexpected given the available scholarships that allow many campers to participate in the six-week program for about $125. Last summer, a group of Darien teenagers helped out by mentoring campers and Gentile saw the potential to get them even more involved. “We said, ‘Why can’t we create a similar model, but have kids be mentors in science and teach to kids at risk?’” he said. This summer, the newly-formed venture crew will be helping out at the camp, not just mentoring the campers, but actually assisting the teachers with a curriculum three members of the crew are developing. Given the increased interest in the program, there will be two concurrent six-week STEM summer camps for low-income children: one at the original site, the SoNo Community Center, and one at a new location, the Benjamin Franklin School. Deciding to branch out even more, there will also be a one-week intensive camp for children in Darien in June. Thanks to a $30,000 grant from the Darien Foundation, the Norwalk and Darien campers will have coding computers, microscopes and other equipment to help them learn more about science and math. In preparation for the first venture crew-led camps, three crew members are spending four weeks creating the new and improved STEM curriculum as part of the senior internship program at Darien High School. “The (idea behind the venture crew) is for youth to work on curriculum development and hone their talents to teach in low-income communities,” Gentile said. 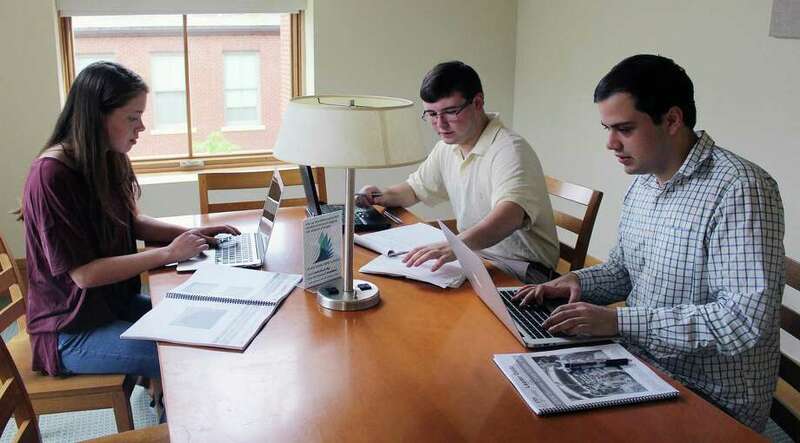 Weekday mornings find Henry Keena, Lindsey Fagerstrom and Jonathan Stimpson researching at the Darien Library. Each of the three has a different focus, with Keena studying up on math and computer science, Fagerstrom looking into alternative energy and Stimpson creating a curriculum based on logic. “We each have a different focus,” Stimpson said. For example, “I come up with experiments with the idea of introducing a logical way of thinking,” the 18-year-old explained. The three have also been volunteering in South Norwalk and Darien, trying out the curriculum on students. Since starting their internship, the students have done two one-hour events at the SoNo Community Center and a six-hour class at the Hoyt Scout Reservation in Redding. Part of the challenge for the teenagers is coming up with STEM curriculum that can be easily comprehended by the children at the camp, which spans from first- through fifth-grade. The three venture crew members are using databases, Google Scholar and different books to help them develop the curriculum. They said working at the library has also been an advantage, with additional resources and help from librarians at their fingertips. The Darien teens have found it’s also helpful when starting out to ask the Norwalk elementary students a lot of questions. “The more we know what they know, the more we can know what they want to learn,” Keena added. One of the additional benefits of the summer program, on top of providing STEM education to low-income students, is it gets more teenage girls involved in STEM through the coed venture crew, which has 12 taking part. With the summer camp, Gentile hopes to get the campers hooked early. “If we get young girls engaged early on, they get excitement to carry them through,” Gentile explained.